Wicca is closely related to Neo-Paganism, and the histories of the two movements overlap considerably. However, the two are also distinguishable. According to Joanne Pearson, Wicca is at once central to and on the margins of Neo-Paganism. “Wicca” is an initiatory mystery religion which blends esoteric ritual forms with pagan mythology and witchcraft folklore. Common characteristics of a Wiccan tradition include duotheism, gender polarity, eight seasonal “sabbats”, ritual drawn from ceremonial magic — including casting a magic circle and calling the quarters — and the practice of magic or “magick“. Wicca was begun in England by Gerald Gardner in 1951 and was imported to the East Coast of the United States in 1963. Gardernian and Garnderian-derived forms of Wicca (called “British Traditional Wicca”) are initiatory traditions, which means that a person has to be initiated by a “coven” in order to become Wiccan. When British Traditional Wicca was imported to the United States, it was transformed by some into an eclectic “Neo-Wicca”, which was heavily influenced by the Counterculture, feminism, the environmental movement, Neo-Jungian psychology, and the mythology of author, Robert Graves. Wiccan mythology and ritual forms were adopted by Neo-Pagan groups which began emerging on the West Coast in 1967, but which had been created independently of British Traditional Wicca. For a number of reasons, including marketing decisions made by publishers of Neo-Pagan books and the adoption of Neo-Wiccan ritual forms by influential Neo-Pagan organizations like the Church of All Worlds and CUUPS, Wicca came to be conflated with Neo-Paganism. Only later did some Neo-Pagans begin to consciously distinguish themselves from Wiccans. Generally speaking, what distinguishes traditional Wicca from Neo-Pagans is the degree of influence of esoteric traditions like the Hermetic Order of the Golden Dawn and Aleister Crowley’s Ordo Templi Orientis (O.T.O.). “Esotericism” refers to a nexus of related quasi-religious movements. The common trait among these movements is secret or hidden knowledge that is available only to a small elect group and only through intense study. This knowledge often takes the form of a system of hidden correspondences between levels of reality. Traditional Wicca is rooted in this esoteric tradition. 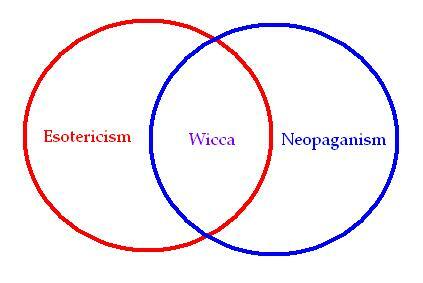 Neo-Paganism inherited some elements of this esotericism from Wicca, but tends to de-emphasizes them. 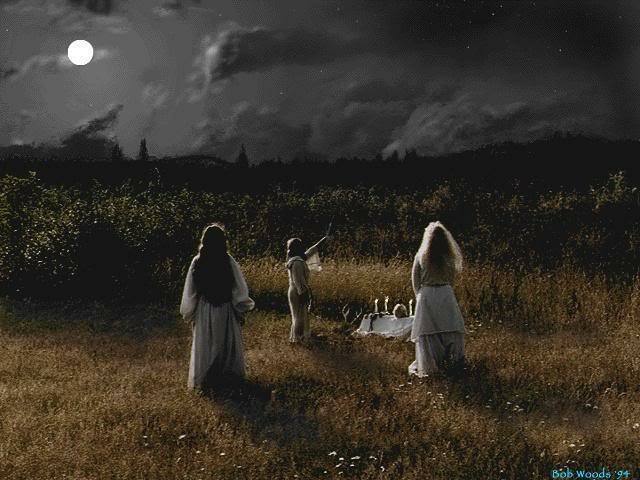 Neo-Paganism tends to be more nature-oriented and celebratory than traditional Wicca. Elsewhere, Ellwood distinguished “occult groups”, which “offer initiation into expanded consciousness through a highly structured production of internal experiences and impartation of knowledge”, from Neo-Pagan groups, “which promote a new vision of man’s relation to nature, the archetypes of the unconscious, and the passions”. According to Ellwood and Partin, Wicca exists in the middle between the esoteric groups and the nature-oriented Neo-Pagan groups. Similarly, Wouter Hanegraaff writes that Wicca gradually and almost imperceptibly shades into non-Pagan esotericism. While perhaps many groups do indeed give the Goddess priority of place in these early years of the new Pagan movements, hopefully they don’t all neglect the God altogether. Letting those who speak with us, or visit our meetings and rituals see that we are NOT practicing the patriarchy, we must not make them think into the bargain that we are trying to establish some kind of “ruling matriarchy.” Balance is one of the lessons taught my many Trads, but it must not be the kind of Balance you can find in a boulder sitting at the bottom of a ravine, stagnant, dead. The balance ought to be a dynamic one, which has duration over the natural cycles, with room for variations which change over time. The Goddess and the God (whomever are those any particular group follows) do indeed briefly take precedence over the other periodically during each cycle, but the see-sawing of the balance is not disrupted thereby. I do understand partly the “faminazii” attitudes from some Dianic groups, as such places are needed for people who have been wounded badly in certain ways. However, once they have their healing underway each individual ought to be able to move on from such specialized groups, having with the healing recovered somewhat of their human maturity, and gradually return to normal life, whatever that is. As a solitary, rather than traditional, British Wiccan I would regard myself as a Neo pagan, especially with my deeply held views on ecology. A lot of the published views of American Indian cultural have resonances in my own experience. My interest in the books Nature Spirits a remembrance by Susan Raven. Animate Earth by Stephan Harding and Wicca by Scott Cunningham are informing my thinking at the moment and are the inspiration for my wish to move to Wales and look at and live some of the Celtic traditions. At this time the rebirth of the God from the Goddess reinforces this dual aspect and the respect for all that harm none whatever their gender or station in Gaia.